Brand is the perception of your organization by the individuals outside of your organization. 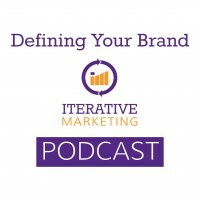 Brand discovery is the first of six actionable components of Iterative Marketing. Without human touchpoints, brands become the face of an organization we identify with and hold accountable. Two aspects of brand definition include what your company holds to be true (values) and the perception of your brand by customers. Interviews, surveys, market research and brand vectors aid in brand definition.